It’s Leftover Week here at Beer and Wine Journal and here are two things you should make from your turkey every year, stock and gravy. Stock is easy to make and you can easily make turkey noodle soup from the stock or use it for cooking. 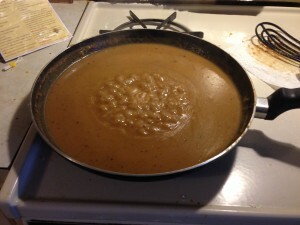 Gravy is also straightforward, but one thing complicates it these days — brined turkeys. If you make gravy from the pan drippings of the brined turkey, it’s going to be very salty. Below I present a recipe that dials down the sodium levels. A base for soup or more flavorful alternative to water when cooking. Note: This recipe calls for a minimal number of spices. Some recipes call for a laundry list of spices. I like to keep the stock simple with the idea that I can always add spices later, but you can’t take spices away. If you know that all your stock is going to be used for soup, go ahead and add whatever spices you enjoy. But if you want the stock to be an all-purpose stock, go with just the vegetables and spices called for above. Take the neck from the bird before you cook it and refrigerate or freeze it until you’re ready. Once the bird is roasted, you can save the carcass by refrigerating or freezing it and making stock later. Freeze the carcass if you’re not going to make the stock within 3 days. Alternately, you can get the stock started right after Thanksgiving dinner. If you’re going to make stock, don’t go nuts cutting every scrap of meat off the carcass. A little meat clinging to the bones is a good thing. Remove the major pieces of the bird — wings, legs, and thighs — and slice up up the breast meat. Remove any skin or excess fat, but leave the rest of the meat. You can make the stock in a large pot or in a Crock Pot slow cooker. Cut up the onion, celery and carrots into roughly thumb-sized chunks. Place bird, neck, vegetables and the bay leaf in the pot or slow cooker. Add cold tap water until contents are submerged and there’s about an inch (2.5 cm) of water on top. You can add more water, but if the stock is too dilute it won’t gelatinize (and you want it to). Add what seems like a reasonable amount of pepper, or slightly less. Heat the mix very slowly towards a boil. If you’re using a slow cooker, set it on low. When the stock comes to a boil, cut the heat so that it is just simmering. If you’re making the stock in a pot, scoop the dark “crud” that rises to the top and simmer for 3–4 hours. If you’re making the stock in a slow cooker, skim the scum and let the stock simmer for 8–12 hours. After simmering, take a spoon and get a small sample of clear stock. Taste it and adjust the pepper, if needed. Don’t salt the stock. Remove the solids with a slotted spoon, then pour the stock through a strainer and into storage containers. 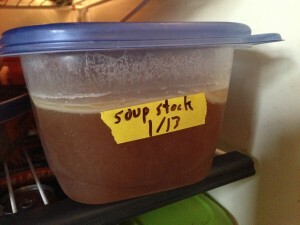 Cool the stock quickly and then refrigerate it. Freeze whatever portion you’re freezing the next day. The stock will form a gel (from the gelatin in the bones) that will melt easily under heat. A layer of fat will form on top of the stock. Leave this on until you use the stock. Then, scrape it off and discard it (or save it if you have a use for turkey fat). Brining a turkey involves letting it sit in a salt water bath for several hours before roasting or smoking. Although this does not make turkey that tastes overly salty, the pan drippings from a brined turkey are usually quite salty. This recipe cuts some of the salt by using low sodium broth in place of part of the drippings. Take the pan drippings and put them in a large measuring cup. Let the fat rise for about 5 minutes. Remove 1/4 cup of fat and place in a frying pan. Measure the volume of the drippings. If over 1 cup, pour out the excess until you have 1 cup. Add low sodium chicken or turkey broth to 1 cup of pan drippings to make 4 cups total. Melt fat under low heat and slowly whisk in the flour. Take about a tablespoon at a time and work it in. Only add more flour when the previous flour has been worked in. Once the fat and flour is mixed, slowly blend in the liquid (drippings and broth). Whisk in roughly a quarter cup at a time and don’t proceed until it’s thoroughly mixed in. You can turn the heat up to medium at this time. Simmer gravy until it reaches the thickness you desire. Add pepper (and any other spices you’d like) to taste. Before you roast the turkey, take the giblets and neck out of the bird. You can lightly sauté some onions, carrots and garlic in butter, then sauté the giblets (with or without the liver or neck) in that mix. Add some water and let that mix simmer for a couple hours (while the turkey is roasting). Strain the resulting liquid and retrieve the giblets from the solids. Chop the giblets, perhaps with some neck meat, finely and add it to the gravy.